Printers need to establish standard operating procedures for delivering accurate color as a manufacturing process that is not subjective. The process of color verification is generally quite easy and can be completely automated in some cases. Color patches are measured from your output and compared to target values, and the results determine a pass or fail. While the concept shouldn't be difficult to grasp, the reality is there are lots of technical details. Let's delve deeper and talk about things you should know and/or consider. First, you must print some sort of color bar or control strip and measure it with a spectrophotometer and software. There are many control strips available for you to use - a current and common choice in North America is the IDEAlliance ISO 12647-7 Control Wedge 2013. These can usually be added automatically to jobs via a RIP. The values that you measure are compared to the "target" values, and a report is generated providing all the necessary feedback to determine whether that print has passed or failed. This eliminates the subjectivity of gauging color accuracy and provides scientific proof for everyone involved in the process. This means no more wondering or pointing fingers when there are problems. The color measurement device you use is very important. Measurement devices from all manufacturers have continually improved over the last several years. Mainly, the light source technology inside the instrument and the "measurement modes" available are different in newer spectrophotometers. For instance, one of the most popular spectrophotometers is the X-Rite i1 Pro, of which there are five revisions. The first four (Rev A-D) were original i1 Pro models, which only measured M0 (if ordered as the standard model) or M2 mode (if ordered as the UV- Cut model). The Rev E devices, called i1 Pro2, have a different light source than the original i1 Pro, and are capable of measuring M0, M1 and M2 (selected in the software). This is very important when targeting the latest CRPC datasets/profiles, which were all measured and published in M1 mode. So, if you're targeting the latest North American printing specifications, you need to make sure you have a measurement device capable of M1 mode. The older specifications, like GRACoL 2006 Coated (CGATS TR 003, 005, 006), were published in M0 mode. The color verification software you use is equally important. You have dozens of options here and it can get confusing regarding which software does what, and which one suits your company best. Much of the available RIP software offers color verification functionality - whether included or an added option - integrated into their products. These RIPs can automatically add the control strip artwork to any incoming job, and they have many choices, including the North American IDEAlliance Control Strip/Wedge and the European UGRA/ FOGRA Media Wedge. Once the print is complete, you can return to the RIP, measure the control strip and print a label with a summary of results or a full report with the summary and details of every measured patch. 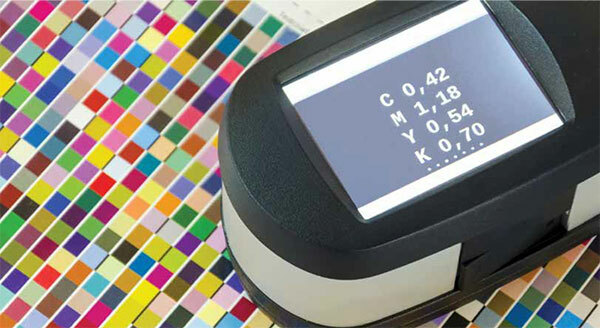 The color verification process can be automated if your printer has an integrated spectrophotometer. Not all manufacturers currently offer this, but as time goes on, you will see more printing devices with "built-in" spectrophotometers. HP's Z-series is an example of printers that currently all ship with integrated spectrophotometers. Epson offers an option called the SpectroProofer for their P-series printers, which is purchased separately and attached. If you have an integrated color measurement device, and the color verification software in your RIP supports it, you can completely automate the color verification process. In some cases, it can even be configured to print a summary label directly on each print after verification. If your printer does not have an option for an integrated spectrophotometer, you will have to measure the control strips manually. You may want to purchase a small label printer, so summary results can be printed and attached to prints/proofs. 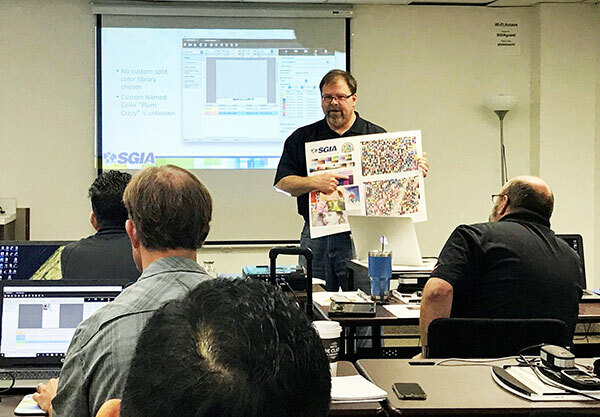 Led by industry experts, SGIA's Color Management Boot Camp workshops provide interactive training on color theory and principles, the latest print verification standards, device calibration and more. Get your color right the first time, every time and put yourself one step closer to becoming a certified SGIA Digital Color Professional. Find upcoming workshops and learn more about the certification at sgia.org. If you have multiple RIPs, this can be more complicated. You may choose to buy or use the color verification functionality available in each RIP. Or, you can use a centralized, single-process control solution for all color verifications. There are many great third-party process control software packages that are not integrated into your RIPs and which do color verifications. Some are quite advanced and highly customizable. Chromix Curve 4 Verify, GMG ProofControl, MeasureColor and SpotOn! Verify are examples of popular software that are feature-rich. And a new wave of cloud- based platforms, such as Chromix Maxwell and ChromaChecker.com, are attractive and exciting. Currently, all of the data that gets measured from the printed control strips lives on one particular computer within the company. If you're doing color verifications on multiple computers - or at multiple facilities - these data files are strewn all over the place. Using a software package that offers a database or using a cloud solution allows for all of your data to be neatly kept in one central repository. The cloud solutions have online dashboards where all of this data is accessible. This enables you to run reports and track devices, ink sets, substrates, an operator's performance, color accuracy, etc. In addition to setting up text and email notifications for any pass or fail verifications, you can import data you measured from another color verification package, so everything is in one place. My recommendation is to streamline the process and workflow to have all the data gathered in one place. The aforementioned IDEAlliance ISO 12647-7 Control Wedge 2013 has 84 patches in three rows. This is a CMYK file and each of the patches are defined as specific CMYK percentages. All the patch values in this control strip are also patch values measured when creating an ICC profile. Therefore, the published measurement data and ICC profiles for printing specifications like GRACoL2013_ CRPC6 contain these same patch values. The software you use to do color verification will automatically extract the 84 patches it needs to compare to the 84 patches you measure. The colors in the control wedge are typical printing system colors: solids (CMYK), overprints (RGB), tints (CMYKRGB), gray balance (CMY/G7/NPDC) and a row of flesh/earth tones. These patches are great for monitoring the overall printing condition for all your printers/presses. (Companies who are doing color verification now are probably only doing this.) This control strip does not contain spot colors, RGB colors, or the colors that are prominent in your client's actual artwork. Most color verifications are done using only CMYK process printing colors. You may also want to monitor the colors in your clients' jobs, including spot colors. Although your printing device may only have CMYK inks, the RIP handles the spot colors in the incoming artwork differently than it does the RGB and CMYK elements, and that requires them to be additionally accounted for. A great example of how this can be done automatically is the functionality in EFI's Fiery XF RIP, Dynamic Wedge. Within the workflow properties, you can specify two control strips. One can be used to monitor printing CMYK device colors and the other to monitor client job colors. When you choose the Dynamic Wedge control strip, EFI Fiery XF will automatically scan the incoming job file and extract any spot colors, along with the most prominent colors in the images or artwork within that file, to build a 16/32/64 patch control strip on-the-fly. This is one of the only products with this capability. Having the ability to verify spot colors automatically is a critical function for many brands, printing and packaging companies whose clients require this information. If automatic is not an option, manually verifying spot colors usually requires measuring individual spot colors from within the artwork, and without a control strip, there is extra time and labor involved. The bottom line is, what do you want or need to measure and verify? Color verification goes beyond the process of measuring patches and comparing their color values to the intended "target" values for feedback. There are also specified tolerances for each patch. Some patches may be important - like the three-color (CMY) gray balance patches (G7/NPDC patches) - and therefore have a very low tolerance they must be under to pass. The tolerances for printing specifications like GRACoL2013_CRPC6 are defined by IDEAlliance and are preset in most color verification software, since these are the most popular color spaces to verify to. However, you can specify your own tolerances (usually lower), if you'd like to maintain a tight tolerance between two printers in your shop and you aren't as concerned about the industry specification. Determining what your tolerances should be is up to you based on how critical color is for you and your clients. Also keep in mind that all the tolerances referred to here were for CMYK color spaces. Don't expect to hit that Home Depot orange or that John Deere green spot color within 3 Delta E, unless you have a printing device with additional ink colors beyond CMYK. The tolerance for this spot color may be 10-12 Delta E, because you simply can't match it any better than that. It is now common for brand companies to define their own color tolerances and specify them to their printing and converting partners. Instead of a specific Pantone(r) number, they may ask for a particular L*a*b* value. If they do, they not only need to specify the Delta-E tolerance, but they need to specify the comparison method (e.g., dE 2000) and the measurement mode (e.g., M1). When configuring properties/ preferences for color verifications, you must specify one of four methods to perform the comparison/calculation - dE CIE76, dE 94, dE 2000 or dE CMC. dE CIE76 and dE 2000 are the most popular, with the latter currently the most prevalent. dE CIE76 is a straight mathematical equation, whereas dE 2000 takes into account human visual perception, and is proven to be more accurate. It's important to note that the 2006 printing specifications used dE CIE76 for color verifications, while the newer 2013 specifications use dE 2000. What you'll see for most patches are primarily Delta-E values. Delta-E is the difference or distance between two colors. It allows quantified examination of a notion that formerly could only be described with adjectives. IDEAlliance specifies that there are three Delta-E tolerances on average (for all patches measured) and six for the peak (or worst patch). These values indicate exactly how the color is performing, whether it's the wrong hue, too light or dark, too saturated, not saturated enough, etc. Notice that density is not a metric included in any of the printing specifications or color verification results, because it is not a color measurement. Density can be derived from a color measurement, so a densitometer can still be utilized for process control in some cases. Knowing each of these metrics and values is essential to being able to fully understand what the numbers are telling you. In summary, you need to have the right tools and you need to use them religiously. This is what we teach in SGIA's Color Management Boot Camps, which offer hands-on training and are held across the country. Once you've got the proper hardware and software, start doing color verification on just one printer. Learn how the process works, get your targets and tolerances defined and establish an SOP for how all your devices will be monitored and maintained. As with any process, practice makes perfect. You'll be a color verifying pro in no time! Dan Gillespie began his career with Lancaster Newspapers, where he introduced desktop publishing and honed his skills and proficiency in scanning and color separation/ reproduction for cold-set web printing. He went on to work for GE Richards Graphic Supplies as an application specialist to train clients in graphics-related software. The only color specialist on staff, he installed scanners and proofing systems, teaching people color management around the country. In 1999, he started ColorGeek Inc., solving color workflow problems for photographers, printers, publishers and converters. He sold the business to Color Management Distribution, for which he is now Director of Technical Service, responsible for pre- sales and technical support for all its expert consultants, certified resellers and clients on design, printing, pre-press and pressroom solutions. Besides his passion for digital imaging, printing and color, Dan is an avid professional photographer. This article appeared in the SGIA Journal, September / October 2018 Issue and is reprinted with permission. Copyright 2019 Specialty Graphic Imaging Association (www.sgia.org). All Rights Reserved.